Dogs get bored. They lie around most of the day doing nothing, often getting inadequate exercise and mental stimulation. If they have to, they will find ways to get our attention, and they will learn quickly that behaviors that annoy us work the best. Often these behaviors, like grabbing the dish towel or barking at us, worked well when they were puppies because we thought they were cute. We laughed at them. A year later, we are frustrated by the same behavior. Dogs, like children, will do bad things if necessary to get your attention. Be very careful that you are not rewarding unwanted attention-seeking behaviors with negative attention. 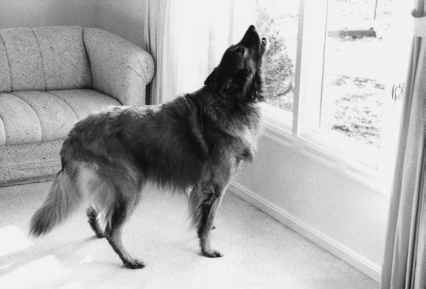 Is your dog barking at you to get you to pay attention to him? Go shut yourself in another room; don't "bark" back at him. Take away the attention, rather than adding to it. You do have to respond to your dog when he seeks your attention in appropriate ways. My Irish Setter is bored right now watching me type this. Occasionally she brings me a toy to play with. I stop and throw it for her for a few minutes. Avoid canine boredom with plenty of exercise and lots of training.